Having already halted the demise of Eileen Gray’s E-1027 into the sea, a French agency sets its sights on restoring the interiors. Before you see the villa, you see sea. Tucked away off a bumpy walking trail outside Roquebrune in the Côte d’Azur, access to Eileen Gray’s icon of modernist architecture is by a small narrow gate, and it is a sea view that the site shows you first. There, raised on pillars, gleaming white in its long narrow form with clever sliding shutters, is the building designed and built from the inside out by Eileen Gray for, and with, her architect lover Jean Badovici between 1926 and 1929. We’re on one of two daily tours that run Tuesday-Friday and it’s a small, but very giddy group. E-1027 – so called as an alphabetic/numeral code; E for Eileen, and the rest signifying the first letter of Jean (10), Badovici (2) and Gray (7) – has been open for public viewing since May 2015 after the Conservatoire du littoral, who are like the OPW for the coastline in France, obtained it and approached English businessman and historic house restorer Michael Likierman to chair its restoration. Michael explains, “I was interested because the first thing I had done when I came to France in the early 1970s was to start up Habitat here. Through that, I got to recognise good, modern design, including Eileen Gray, who was a goddess of design.” At that time, Gray had just been re-discovered, was still alive in Paris and there were re-editions of her furniture being produced. 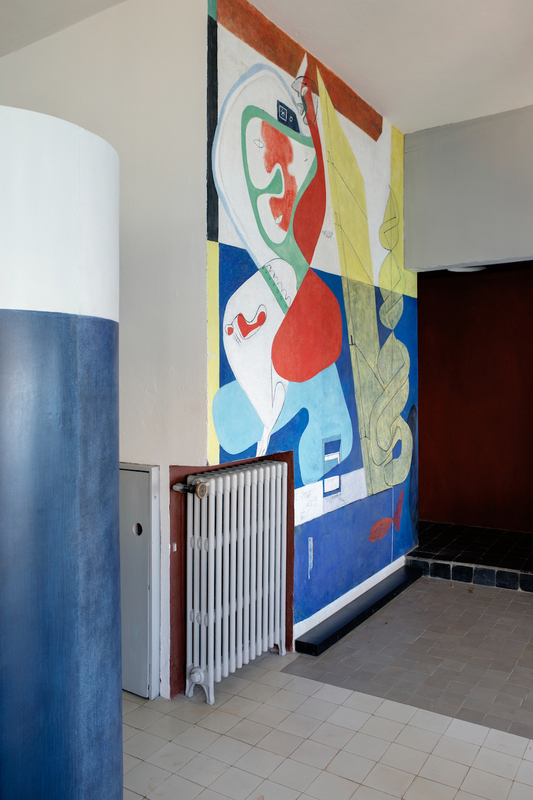 Born at Brownswood House near Enniscorthy, Gray studied art in London, before learning lacquer from the antique shops in Soho and moving to Paris, where she developed contemporary furniture with futurist shapes and influences of Cubism. It’s easy to look at her work now and think of it as standard, but her experimentation with materials such as tubular steel, and use of pure line and colour was groundbreaking at the time. You only need to google “interior design 1929” to see how far ahead of her time she was. E-1027 was her first attempt to create an organic unity between a building and its furnishings, completely tailored to two specific inhabitants. Although restoration work didn’t start on E-1027 until 2014, Michael’s team have already done a lot. “We have a six-year mandate, which expires in 2020, to get the house fully restored and open to visitors within that timeframe. That’s the task we set for ourselves.” After Gray left in 1932, the house had a lively history; from Le Corbusier’s well-documented relationship with E-1027, to various private owners, a murder in 1996 and the squatters that moved in shortly after, it has, quite literally, been through the wars. Eighty years of Mediterranean rainfall haven’t been kind to the villa either, as Michael explains. “The great problem with houses built down here is water; rain that comes in from the sea and through moisture in the air, but it also comes from water that floods down the terraces in heavy rainfall and undermines the foundation of buildings.” Their first task was to ensure the structure was sound and sitting on solid bedrock. As it was, the concrete of E-1027 was full of water and the iron reinforcements in it were being corroded. Thankfully, the Getty Institute in America stepped in and gave the Conservatoire du littoral a grant, which half-funded reinforcing the structure. The open-plan living area with many now familiar furniture pieces, which were originally designed for the house. The great key to this house is its decoration, and its furniture and fittings require a further million euro for restoration. “Eileen Gray was an architect in this case, but she was also a designer, so it’s her designs that we are now trying to get back and restore,” says Michael. In addition, the Conservatoire du littoral needs a further half a million euro to provide wheelchair access, as it’s a site that is currently difficult to visit. The French government have offered to pay half, so long as the rest is fundraised, but €750,000 is no small sum. Michael makes no bones of who he hopes will contribute to fundraising. “This is a piece of Irish history in France; that is what we are trying to preserve. Individual fans of Eileen Gray may make small donations; specialists in 20th-century furniture may donate more. I’m very interested in businesses in Ireland, who by helping us, can demonstrate their commitment to being in Ireland, and to helping to advance Irish design.” All said, Michael admits he is “looking for a broad church of people”. An international community coming together to protect and preserve the magnificent modernist work of one of Ireland’s pre-eminent designers? That is the task set to us. Tours of E-1027 can be booked through Cap Moderne, or you can donate to the fundraising campaign here.